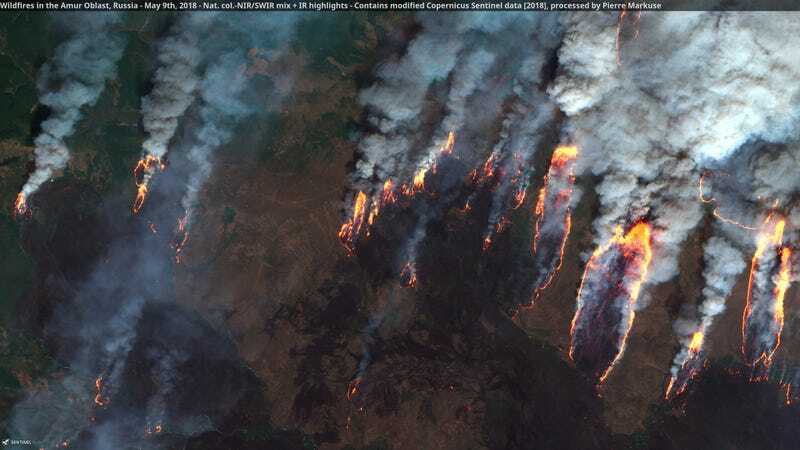 Wildfires captured by the Copernicus Sentinel satellite. Dry, warm weather has primed Siberia for wildfires this spring. After a moderate outbreak in April, the countryside has lit up in a major way in May. The fires are the latest in a litany of changes taking place in the northern part of the world. Wildfires lit up last week in Russia’s Far East around Komsomolsk-on-Amur, a city of nearly 264,000. The Siberian Times published images of flames engulfing roads, fields, forests, and anything else in their path. In harrowing video published by RT, a conductor took his train right through the flaming countryside. “We live and work in such complicated circumstances,” he said in his narration, which could also double as metaphor for life in 2018. Satellite images captured late last week show active fires spanning an area nearly 290 km (180 miles) wide, according to remote sensing expert Pierre Markuse, who has been tracking the fires. Local news outlet Amurskaya Pravda reports that 671 firefighters are currently helping battle multiple blazes. Beyond the wild flames, noxious smoke has engulfed the region. Residents in Komsomolsk-on-Amur described the conditions to the Siberian Times as a “smoky hell.” Their hell is visible from a million miles above the Earth’s surface. Mark Parrington, a wildfire researcher at the European Center for Medium-Range Weather Forecasts, noted on Twitter that the smoke plumes were so large last week that they were visible on images snapped by the DSCOVR satellite. The fires have been fueled by abnormally warm, dry weather. While the heat remains, rains have helped tamp down fire activity to start the week. “Depending on the weather the next days might show more activity again,” Markuse told Earther via Twitter DM. In Siberia, local farmers will often light fires to help clear cropland and replenish soil nutrients. Those fires can sometime burn out of control if winds sweep them up. Natural spring and early summer fires are also commonplace in Siberia and elsewhere in the boreal forest that runs in a ring around the world, through Alaska, Canada and Scandinavia. But those fires are becoming more commonplace due to climate change and other human activities like farming. The northern part of the world is warming faster than the planet as a whole. That heat is drying out forests and making them more susceptible to burn. A recent study found Earth’s boreal forests are now burning rate unseen in at least 10,000 years. This was evidenced last year, when smoke from Canadian wildfires drifted over the North Pole, and the year before when Fort McMurray was devastated by wildfires (and don’t forget Siberia then, too), and the year before, when it was Alaska’s turn to burn, and well, you get the point. Those fires all release carbon dioxide into the atmosphere, creating a dangerous feedback loop of increasing temperatures and worsening wildfire conditions. They’re a reminder we need to get ready for super fires fueled by climate change now. And that we need to cut carbon pollution before they get worse.